There are two very good books published by Theosophy Company (for the United Lodge of Theosophists) which present Theosophy to children in an interesting way, designed to get the children to think for themselves about the information they’re reading. The only drawback – if it is a drawback – is that both these books now have a somewhat antiquated quaintness to them, due to having been written between 70 and 90 years ago. But they’re still in print and still used in “Theosophy School,” at the various ULT Lodges which still run a Theosophy School for children once a week. 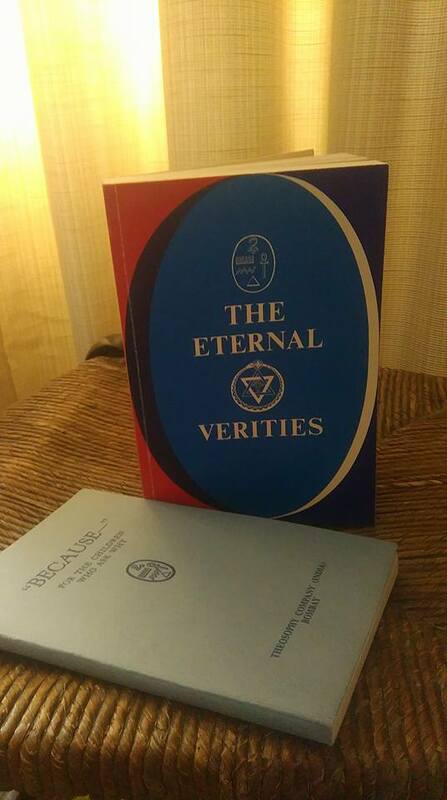 One book is nearly 300 pages long and titled “The Eternal Verities” with the subtitle “For Old Souls in Young Bodies.” Its numerous lessons revolve around the Three Fundamental Propositions of “The Secret Doctrine” (by H.P. Blavatsky) which this book calls “The Three Truths,” presenting them in clear and simple language which any English-speaking child above the age of 7 should be able to understand, without altering or distorting the actual Theosophical teaching. It can be useful for adults to read the book too, as it provides indications as to how we can discuss and introduce Theosophy most simply and effectively to people we know who may find it bewildering, intimidating, or offputting to hear such phrases as “Three Fundamental Propositions of The Secret Doctrine.” “The Three Truths of Theosophy” or “The Three Truths of the Ancient Wisdom” can potentially be more effective in such cases. The other book is “”Because” – For the Children who ask Why” and is easier to read than “The Eternal Verities” because of it being shorter and also having a story type format in which a brother and sister are introduced to the teachings of Theosophy through their “Aunt Eleanor” who they go to live with after their mother dies. “Coming home from school today, Aunt Eleanor, we passed the new store which is just building. A man was going up a ladder with a hodful of bricks, when one of the bricks fell out and hit a man walking below. It hurt him badly. Anyway, it hit his nose and made it bleed. Now, how could that be the Karma of the man who let the brick fall, when he didn’t even know it had fallen?” queried Milton. Click here to visit our Books on Theosophy page.